There are some artists who, once they’ve found their strong suit of musicality, don’t need to do all that much in variation in order to make the public’s ears perk up and fans’ praises to rain down. The founding formula is the strongest and twists thereon don’t have to be severe. Collaborative folk trio, I’m With Her fits exceedingly well into this category, save for one crucial aspect of their artistic character: I’m With Her refuses to stagnate among patterns and melodies that if they chose, would likely be otherwise still enjoyed by their audiences. Sara Watkins (guitar, fiddle, ukulele, vocals), Sarah Jarosz (guitar, banjo, mandolin vocals), and Aoife O’Donovam (guitar, vocals), play the kind of instruments that are ubiquitous among peers sharing their same genre space. 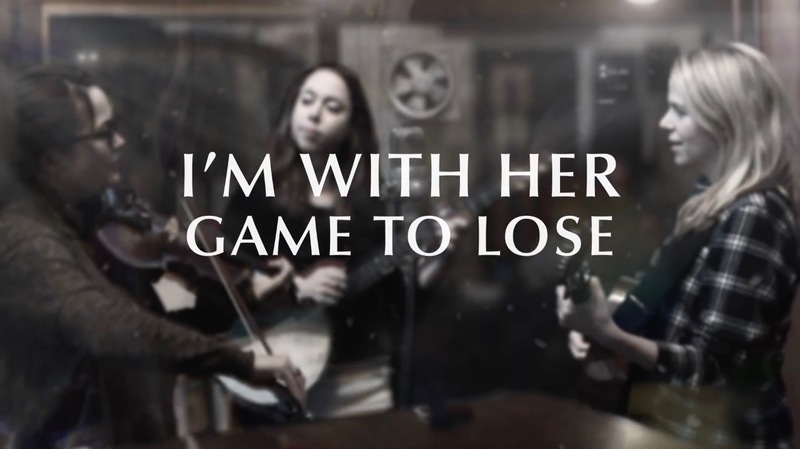 In fact, as is the case on the trio’s newest single “Game to Lose,” there are moments when the melodies played by the band make them sound eerily like that of Watkins’ other shared venture, Nickel Creek – a trio of guitar, mandolin, and fiddle. However, despite also performing with a similar laid back and almost-improvisational-but-still-adept style, I’m With Her continues to set their common arrangement apart with uncommon compositional choices. “Game to Lose” is no exception to this approach. The overall delicate and precise harmonized singing by O’Donovan, Jarosz, and Watkins permeates”Game to Lose” just as much as any of the three women’s previous songs. That aspect of I’m With Her’s combined power is like the primary backbone of their sonic identity that has shone through every piece released to now and is likely to be a central factor of admiration over the rest of the music on See You Around (Rounder Records, 2018). Those who may approach this new song casually may not immediately pick up on a factor of exorbitant distinction between any two I’m With Her performances but that’s not to say it’s difficult to find thoughtful new direction in “Game to Lose.” Vocally, though each of the women contributes an abundance of harmonies and constantly shifting dynamic backup support, O’Donovan leads on the main melody vocals for the song’s chorus, shifting from the focus given to Jarosz for the previous release (How much longer is it gonna be / before I get where I’m going, get what I need? / You gotta give to get / You gotta be game to lose). Running slightly shy of four minutes, while “Game to Lose” stretches past the length preferred for most radio-ready benchmarks, the track actually turns out to have a lyrically minimal presence. The remaining time is filled with swiftly and smoothly performed instrumental breaks combining all manner of O’Donovan, Watkins, and Jarosz’s musical skills, which are nothing to ignore in their own rights. It’s in those wordless spaces that the subtle, but still individual, character of each player’s handling of their instruments can become more and more familiar in one’s ear. (Listen to a musician enough and recognizing their performances against someone else on the same instrument, who plays in the same style, becomes easy.) Put that kind of individuality together with the overall individuality of “Game to Lose” and the interludes transform the song into a conversation of sorts; one where each member of I’m With Her is speaking to the others, and to listeners, with their respective instruments and, in those parts, their instruments become them. Thoughtful listening comes in particular handy for everything from Watkins’ use of grace notes to create a carefree swing that makes legato bowing feel fun over formal, to the extra decorative syncopation bestowed upon the main hook when played on the mandolin and banjo between verses. Setting the stage of “Game to Lose” with quiet vocals that, though harmonized, are rhythmically in unison and separately only by narrow tonal gaps, establishes a sense of closed off shyness and reserved hesitation. Yet, as the first verse progresses toward the pre-chorus and then the chorus, the gentlest increase in dynamic singing level for the band pairs with the depiction of an individual who is working toward confidently overcoming their adversities.“Game to Lose” ever-so-carefully instills that sense of a change in the song’s protagonist, even though the aforementioned chorus merely offers generalized questions over her present challenges and outlines for listeners how things could change but not saying they in fact, are (You gotta give to get / You gotta be game to lose). The way “Game to Lose” weaves chord progressions that are not only major and minor but also seems to inhabit the more complex tonal spaces between them both – occasionally exuding a nearly blues-like pattern on O’Donovan’s highlighted vocal part for example, yet floating just on the edges of its boundaries without a full tonal embrace – provides strong display of how I’m With Her chooses to stay well outside of the safe compositional space to which the band’s sound lends itself. Even if lyrics are not the primary driving force of “Game to Lose,” the way the trio juxtaposes dynamic levels with what lyric lines are there, is what serves to push the song forward and foster emotional anticipation and release over the course of the track. A continual takeaway from the songs I’m With Her writes, that “Game to Lose” now perpetuates, and which is liable to be a big element of praise for the remaining full album, is that by the time any one song is over, listeners will step back and realize there is a musical trail littered with intricacy and creative forethought in song structuring – one that has the possibility of going virtually unseen at first but, absolutely cannot be unseen afterward. 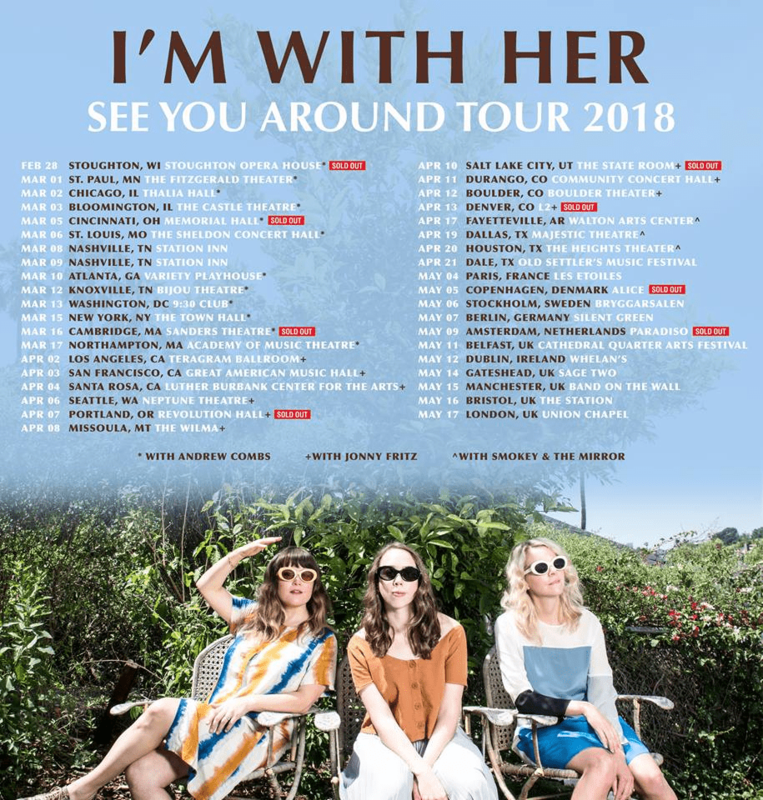 I’m With Her is prepping for an extensive world tour (supported by Andrew Combs, Smokey & the Mirror, and Johnny Fritz,) that starts on 28 January in Glasgow, Scotland. They play The Town Hall in New York City on March 15. Full list is below and links are HERE.